Mokume Gane is a Japanese metalworking procedure which produces a mixed-metal laminate with distinctive layered patterns. Mokume Gane translates from Japanese closely to “wood grain metal”, describing the way the metal takes on the appearance of natural wood grain. 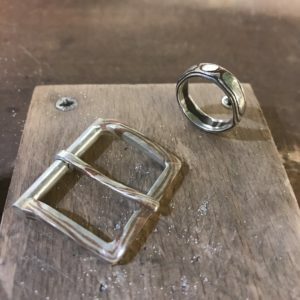 On this course, students will learn how to create a billet of Mokume Gane, how to forge the billet into a ring, and how to apply a patina to accentuate the colours of the metal’s surface. Max of nine places available. Two day course, full attendance is required, places non-transferable. Full payment required to secure a place. A minimum of six participants are required for the course to run. Please note the cost of the course is not refundable. Once payment is received we will send an email confirming your place on the course – just let us know if you would like a place by calling 01582 833800.